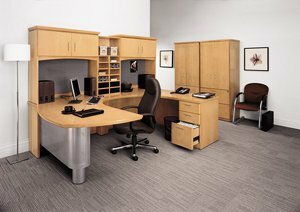 For quality desk furniture that will last for years and can add to any office’s aesthetics, turn to NorthPoint Office Furniture. For almost two decades, NorthPoint has provided homeowners and businesses in Alpharetta, Johns Creek, Sandy Springs, and other areas in and around Atlanta, Georgia, with new and used office furniture. We offer products from only the most trusted names in the industry, like Global, DMI, Martin Furniture, HON, Cherryman Industries, and more. In order to find the perfect desk furniture for your home or office, we recommend visiting our 8,000-square-foot showroom in Roswell, GA. Our fully staged displays will help you see exactly what our furniture looks like in an office setting, plus you’ll be able to open and close drawers and sit at the desks and other office furniture that you may be interested in purchasing. Not only do we offer a full range of traditional, transitional, and modern office furniture, but at NorthPoint we also provide unparalleled customer service. If you’re unsure about how new desks, chairs, or other furniture will fit into your home or office, we can offer space planning strategies that could make your office space more efficient or enhance its aesthetics. Once you’ve purchased your furniture from NorthPoint, we will assemble everything at no additional charge to you. Plus, we honor all manufacturer warranties and will help you replace lost or damaged furniture if necessary. To learn more about the desk furniture and ergonomic chairs we offer for businesses and homeowners in Marietta, Dunwoody, Milton, Kennesaw, and other areas in and around Atlanta, Georgia, contact us or visit our showroom today.